I’ve been rushing about, leaping from one task to another. April has kept me hopping, between preparing prints and hanging them for my show which opens this week, planting seeds and transplanting my veggies starts to the garden, doing our income tax returns, and a long list of other “must-do’s”. With April almost over, we’re now in a time of transition. The short pauses between songs are getting longer and the nighttime voices fewer. Soon our yard will be quiet at night – but that won’t mean the frogs have deserted us. They may be leaving the pond, but they’re not going far. By August we’ll delight in finding tree frogs of all sizes everywhere in our garden, enjoying the warmth of the sunshine or the cool of the “rain” that the sprinkler has delivered. They sometimes land on us when we walk under the apple trees, and we find them inside our compost tea barrel when we lift the lid to water the tomatoes. Other times, they’ll just be hanging out on a gently swaying leaf, like the fellow in the photo above – enjoying the moment, or perhaps contemplating what the next great leap will bring. 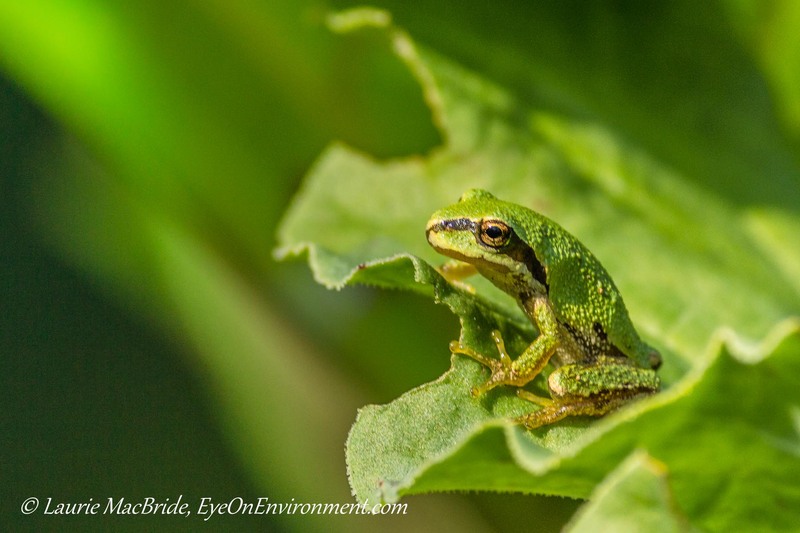 Posted by Laurie MacBride, Eye on Environment on April 28, 2014 in Amphibians, Animals & Wildlife and tagged animal behavior, frogs, Gabriola, gardening, nature, photos, ponds, spring, wildlife. I’m so happy to hear about your show. Wish I could see it in person! Would love to see what you did with the nifty fifty. This is such a great capture of a cute little guy and I enjoyed reading about the froggy chorus. Thanks Sherry! I wish I could transport you here so that you could see it – and I could see you! The frog image was actually done with a different lens (I took it last summer, before I had the 50mm). It’ll be fun to take some frog pix this summer with the 50mm and compare them. You just have to know that I would LOVE this shot! Great character in your flippered friend there, Laurie, and I really really enjoyed your accompanying words! Thanks so much, Toad. Who could NOT like this cute little guy, eh? Super cute little guy in a beautiful setting! I love the transition between seasons. All creatures, including these frogs, have a lot to teach us about being contemplative. Congratulations on your show, Laurie. Thanks, Kim! You’ll be pleased to know that a number of the prints I’m showing were taken with my 50-mm – which continues to be my favorite lens.